On January 24, 2014, a Hesperia man was killed when crossing Santa Fe Avenue in the early evening. A 43-year-old man, Robert Colunga, Jr., was fatally struck by a 2002 Dodge Ram truck. Our deepest condolences are extended to the Colunga family for their loss. This tragedy poignantly evidences the statement as to how dangerous crossing a street can be. There are teaching points to be learned from any car v. pedestrian accidents. 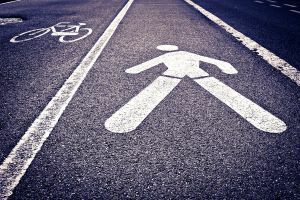 First, even though a pedestrian may have the right of way in the roadway, awareness of the surrounding traffic is critical to one’s own safety. Second, any driver going through a crosswalk must be highly vigilant to make sure the area is clear of pedestrians. Otherwise, even a momentary lapse of attention can be devastating. I remember driving through Los Angeles on my way to a meeting in Beverly Hills. As I was driving, I was particularly aware of the several individuals crossing the many streets in my path. I was amazed how many of these individuals were subject to near hits as drivers failed to provide ample and safe room between the unprotected pedestrian and the heavy unforgiving cars that were zooming by. If you have been subject to a car v. pedestrian near hit, or even been hit by a car, share your story so others can learn from it. If you need legal help to properly recover from injuries from an accident, give us a call to learn about what rights you have.